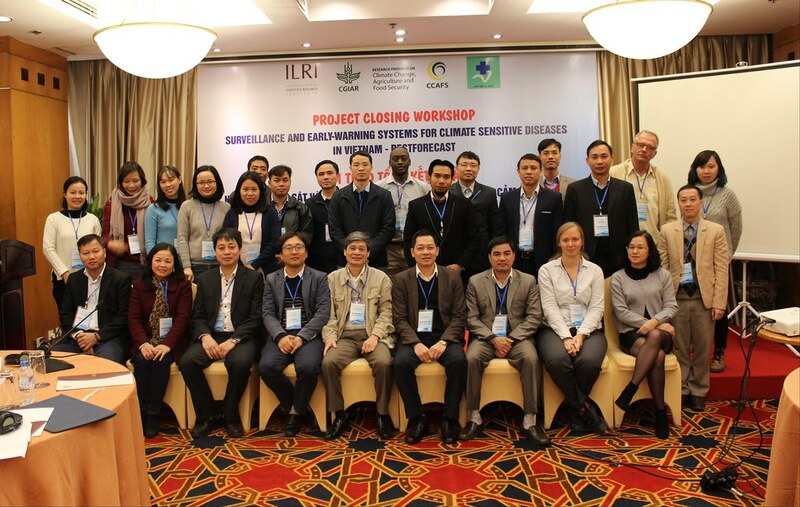 On 22 December 2017 animal and human health experts gathered in Hanoi, Vietnam to discuss ways of disseminating the findings and recommendations of a ‘Surveillance and early-warning systems for climate-sensitive diseases in Vietnam and Laos’, or Pestforecast project. More than 35 experts from the livestock, animal health, public health and agriculture sectors in the country, representing funders, national institutes, government at both central and provincial levels, embassies, civil society, research academia and the private sector attended the meeting. In opening remarks, Hung Nguyen, regional representative for the International Livestock Research Institute (ILRI) in East and Southeast Asia, said that the climate-sensitive diseases (CSDs) such as Japanese encephalitis (a viral disease), leptospirosis (a bacterial disease), aflatoxins-related diseases (fungal) and dengue which the project focuses on affect the poor, including smallholder farmers, in rural communities and addressing them can enhance social equity in the country by improving agricultural productivity, and human and animal health. Hu Suk Lee, a researcher at ILRI and the project’s postdoctoral, said Pestforecast has come up with evidence-based tools such as risk maps, and seasonality and climate-associated models for use in assessing CSD’s in the country. More importantly, the project has established an active One Health research partnership in Vietnam. However, he said, challenges such as lack of surveillance systems and the shortage of resources for implementing/sharing tools need to be addressed to enable farmers to better manage these diseases to improve their lives and the welfare of their farms and animals. Findings from the project’s research on Japanese encephalitis, leptospirosis, aflatoxins in maize and pigs and dengue which are sensitive to climate as well as public health concerns were discussed. Evidence from the project will inform policy and on-going climate change resilience research by partners. Livestock, animal health, public health and agriculture sector experts at the closing workshop of Pestforecast project (photo credit: ILRI). The project team will finalize, in collaboration with the team of CGIAR research programs on Agriculture for Nutrition and Health (A4NH), two key tools that will be used in identifying CSD hotspots, prediction and target interventions in Vietnam. These include a set of risk maps of CSD and a web-based tool for forecasting disease incidences considering meteorological and environmental factors that influence CSD risks. Pestforecast was started in 2015. The three-year project in Southeast Asia is supported by the CGIAR research programs on Climate Change, Agriculture and Food Security (CCAFS) and A4NH and coordinated by ILRI in collaboration with a wide range of partners including the Vietnam National Institute of Veterinary Research, the Plant Protection Research Institute, the Institute of Meteorology, Hydrology and Environment, the Plant Protection Department, the Hanoi University of Public Health and the National Institute of Hygiene and Epidemiology. Tags: aflatoxin, closing workshop, encephalitis, leptospirosis, Pestforecast. Bookmark the permalink.